This place is tiny (as in only maybe 8 tables – tops – in the winter and a few more on the sidewalk), but it serves up some heavenly crepes and French bistro fare. This is my go-to place whenever I want to have a leisurely breakfast or lunch featuring a good cafe au lait and feel like I’m back in Europe sitting in a little corner bistro. My first meal here was a memorable fondue dinner featuring the most amazing White Bordeaux back when it was Le Oui Oui Cafe. For such a small place and “limited” menu, the food is simply outstanding. I have never had a bad meal here. They serve a delicious Salad Nicoise (featuring pan-seared salmon filet, redskin potatoes, green beans, olives, tomato, hard boiled egg, and a peppercorn dressing), Croque Monsieur (ham, Gruyere and Bechamel sauce served warm on grilled challah with a side of potatoes), Croque Madame (the same sandwich but topped with a fried egg) and crusty baguette sandwiches. They are also known for their savory and sweet crepes and a delicious and filling French onion soup. I was craving a baguette sandwich after watching Martha Stewart make one on her show, so I decided to enjoy a late lunch recently. I started with the French Three Onion Soup, which is topped with Gruyere and is vegetarian-based. 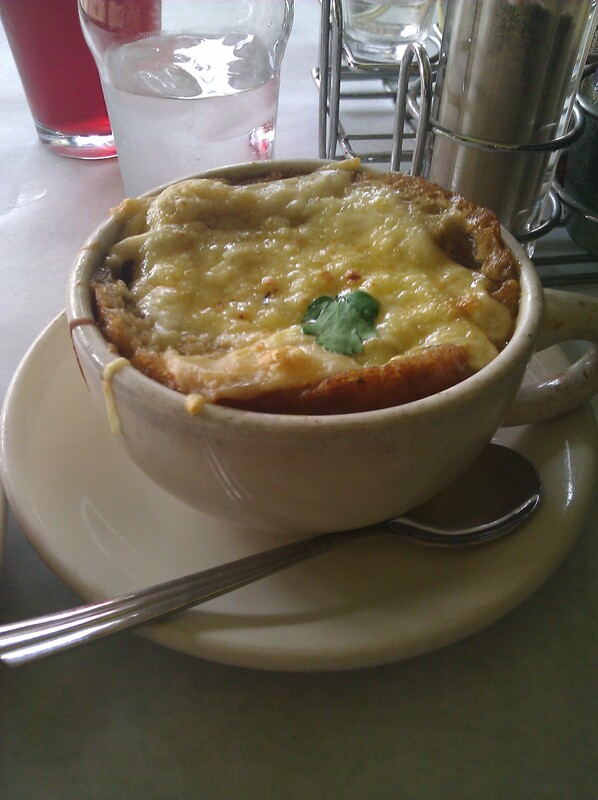 Life just seems complete when you are eating a nice steaming bowl of French onion soup. Digging through the melty Gruyere cheese, tearing off some of the hunk of bread at the bottom of the bowl and getting the perfect amount of onions and broth is decadence at its best. In fact, I couldn’t wait to let it cool a bit before I dug in and burned my mouth. Do yourself a favor and let it cool just a bit. 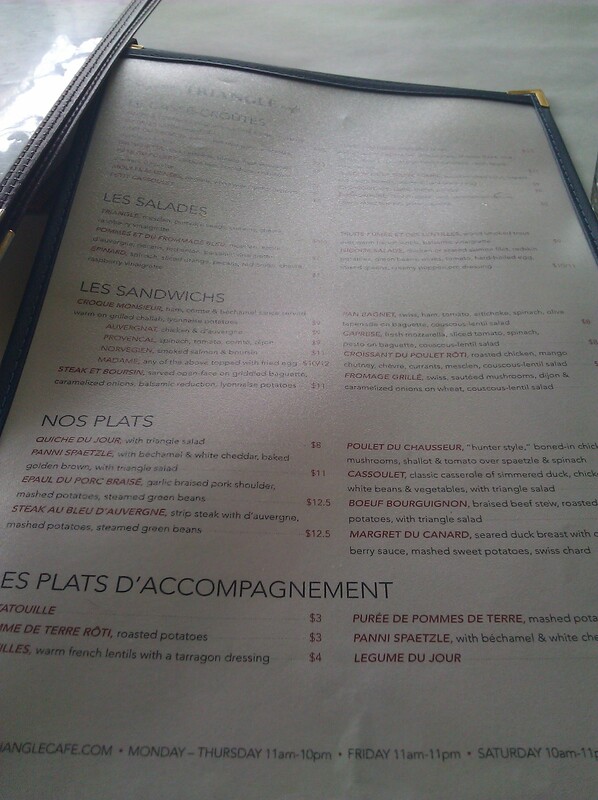 For my baguette sandwich, I was torn between the Pan Bagna, which features Swiss cheese, ham, tomato, artichokes, spinach, olive tapenade on a baguette and served with a side of couscous-lentil salade, or the Caprese (fresh mozzarella, sliced tomato, spinach with pesto on a baguette). The server (who also happened to be the owner) recommended the Pan Bagna, so I went with her recommendation. Wow, it was great! The olive tapenade really made the sandwich shine. 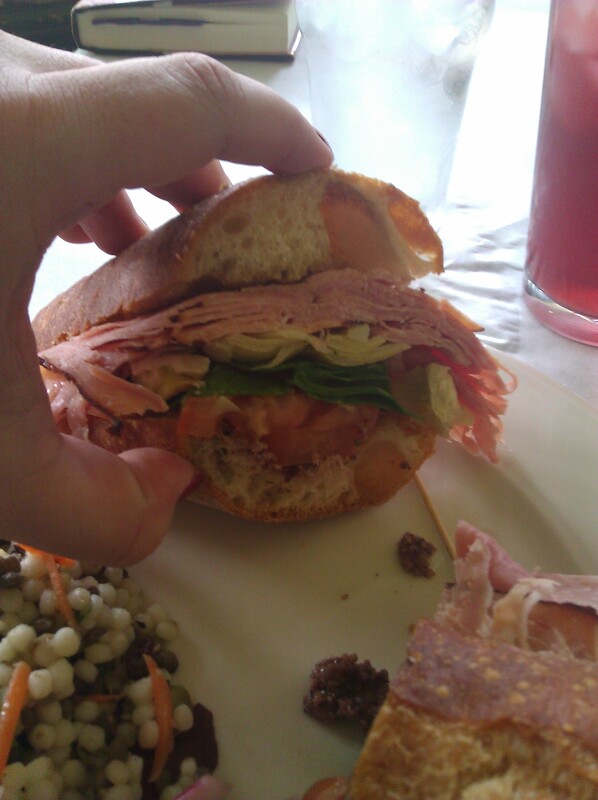 As you can see from the side shot of the sandwich it was just packed with cheese, ham and veggies. And have I mentioned the olive tapenade? Soooo good! If you still have room, I highly recommend ordering one of their sweet crepes. They are absolutely divine. They are open Monday and Thursday from 10 am-10 pm, Friday and Saturday from 10 am-11 pm and Sunday from 10 am-9 pm. Did you know that they have another room with more seating? We just discovered this on our last trip there. I love this Ohio City spot! Thanks for sharing your experience. No, I had no idea. That is awesome!